Looking for a stunning spacious home with lake views? 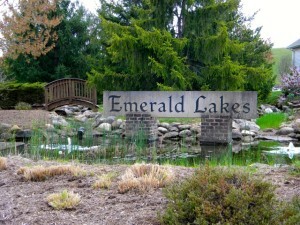 Emerald Lakes has just the home for you in scenic Medina Ohio! Enjoy meticulously maintained curb appeal along with gorgeous lake and country views! Priced to sell, these colonial and ranch homes offer luxury living at its finest. Whether you are looking to downscale or not, Emerald Lakes has the floor plan you desire! Featuring three to five bedrooms, the layout of each home is functional and cozy. Flooded throughout with natural light, enjoy the bright open feel! Eat-in kitchens are spacious with gleaming oak cabinetry and ample counter space. Cooking is a chef’s delight with high-end appliances and a convenient center island! Formal dining rooms set a comfortable tone for entertaining guests. Relax in the two-story great room while keeping warm by the fireplace during cold Medina months! Create a home office or den with one of the spacious downstairs bedrooms! Work in peace while gazing out at lake views! Upstairs you will find a comfortably sized master suite with vaulted ceilings and a walk-in closet. Private baths offer the ultimate relaxation with glamour baths that include dual sinks and a soaking tub! Additional bedrooms are also graciously sized with plush carpeting. Fall in love with your finished basement, creating the getaway space of your dreams! If all that wasn’t enough, walk out to your deck and revel in the fresh Medina air! The panoramic green and lake views are breathtaking. Invite friends over for a barbeque or simply unwind in peace after a long day. Oversized attached garages provide ample storage space not only for your cars and toys but a workshop as well! Come take a tour of Emerald Lakes and find the home of your dreams! Medina is a wonderful family town with top rated schools and no city taxes! Take advantage of the recreational activities available such as hiking, boating, rock climbing and archery! There truly are no limitations as things to do in Medina! Minutes from I-71 you’ll have no problem commuting! No need to travel far as Medina has plenty of shops, restaurants, entertainment and nightlife to offer! Call one of our Medina home specialists today and take a tour of Emerald Lakes! Contact us for a private showing of Emerald Lakes Homes for Sale.